Right, tomorrow night sees Manchester United make their play for a European final. They lead Celta Vigo 1-0 from the away leg. We will have all the updates and audio from the 'Dream Theater' right here. This was the Real Madrid post-match celebration that went down like a lead balloon with the Atletico Madrid fans who had hung around in the Vicente Calderon. It is not quite Greame Souness planting a Galatasaray flag in the middle of Fenerbahce pitch, but not the most tactful display on their last visit to the Vicente Calderon. Meanwhile the Atletico fans were also sheltering beneath their own seats. Without sitting down. More from Arsene Wenger on his Arsenal goalscorers: "Sanchez is tricky in a short space. He’s always got invention and can surprise anybody. "Olivier is a fantastic player. It's difficult for me at the moment between Danny Welbeck and Olivier Giroud. There's a great team spirt and it's always harsh on the one that doesn't play." On Alex Oxlade-Chamberlain, who went off injured: "We don’t know how bad it is. It’s a tight hamstring. We’ll know more in the next 48 hours." Dave Wood: Surely Buffon can't go through his career without a Champions League winners medal? He can't, can he? "It’s a shame and a big frustration"
Southampton manager Claude Puel speaking to Match of the Day: “It’s often the same against the big six. We cannot find a win. Every time we play good quality football with chances but without the clinical edge and it’s harsh on the players. "For me, we deserved a minimum a draw and maybe a win. For them, in one situation, they scored. It’s difficult to accept. "We know the top six have solutions. We have good players and young players who can improve. It was interesting for many moments but it’s important to score. It’s a shame and a big frustration. It was another game against the top six side without reward." App users may need to use the link to view this post. Dave Payn: Juventus have been supremely consistent this season in all areas. Can't see anything but a Juve win in the final. Arsenal manager Arsene Wenger speaking to Match of the Day after his side's win over Southampton: "We were focused and I felt that when we suffered we stuck together. "We have another clean sheet and I know we can go forward and score goals. The whole team was dynamic, focused and showed a convincing desire to win the game." Ian Rush and John Charles? Which way will the local support sway? Arsenal goalkeeper Petr Cech told Match of the Day: "Every game we try to give ourselves a chance. We shot ourselves in the foot against Tottenham and we are aware we need to win all the remaining games to be in the race (for the Champions League). "We had a big game against United and then here, where historically we haven’t done that well in the league. "It was tough in the first half but then we found the opening and deserved to win." It was a special night to be here. The fans made the atmosphere amazing for the last European night at the Vicente Calderon. This is a photo taken a few moments before the missiles started raining down towards the Real Madrid team as they attempted to celebrate with the top tier and ignore the bottom. App users may need to click through to view content. Real are in the final again and deservedly so. It's been a masterful performance from them across this competition. The goal really killed off the tie and Isco was the best player over the two ties. It wasn't even Ronaldo who starred tonight. 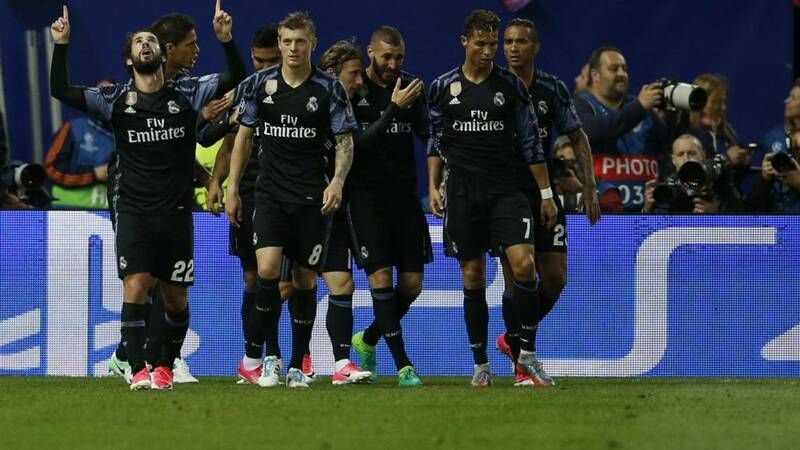 It was Benzema, Modric, Isco - they all shone tonight. There are some real end-of-term scenes at the Vicente Calderon. The Real Madrid players have come back out to celebrate with their small band of travelling fans in the upper tier. Unfortunately for them some of the Atletico Madrid fans have also hung around. And they are on the lower tier and within object-chucking range. Meanwhile other Atletico Madrid fans have ripped up some of the seats to shelter from the rain. They still have another game to go at the ground. While Atletico and Real have been sorting out their differences at the Vicente Calderon, Arsenal have eased aside Southampton in the Premier League via goals from Alexis Sanchez and Olivier Giroud. The Gunners are three points behind Manchester City in fourth and four behind Liverpool in third. The kicker might be that they have a game in hand on Liverpool. We will bring you all the reaction from that one right here. That result doesn't tell the full story. It was so exciting at 2-0 but that crucial away goal changed everything. It's not been a bad first full season for Zinedine Zidane. Real Madrid's players huddle up and celebrate a 15th European Cup final and the chance to defend their title. Juventus in Cardiff on 3 June is the date in their diary. Dan Washbourne: To say he's practically chiselled from rock these days, it's funny how a stiff breeze could still knock Ronaldo over.